Only a few months after buying my expedition vehicle, i've gone and bought a whole new set of tyres. Whilst not wholly necessary, I felt it was an important move. My choice of tyres were 235/85 R16 BF Goodrich All Terrains. I've had experience of using these in Ghana. They have a good reputation and a lot of people use them on expedition. They're more versatile than mud terrains, being good on surfaced road (as the vast majority of my time spent I will be driving these), but I have also found all-terrain tyres to perform very well off road (assuming of course that you drive accordingly), although they will never be as good as mud terrains in that environment. My expedition wheels of choice are the epitomy of my belief that what Land Rover designed as original equipment is more than adequate for the job; albeit the Wolf wheels I bought being the heavy duty upgrade for expedition. I rims I got for £100 from eBay (2010). They needed a bit of touch-up paint, but a bargain considering they go for £60 each brand new! The 4 tyres came to £473 (2010) from Camskill. Fitting cost £60 at Kwikfit with a balance (the reason for the yellow spots on the sidewalls). It was a bit extortionate but it was next door to work and I needed them done quickly! Another reason I wanted new tyres was that the existing ones were 235/75, so were the same width as standard but were an inch smaller in diameter. This adds up to a good 5% less gearing ratio than standard. Expecting to do quite a few miles in this vehicle, I thought it best to get the economy up from the start. On comparison, the Wolf wheels have a different offset than the standard Land Rover wheels, which means that they extend towards the axle the same amount but extend outwards more. This has the benefit of adding stability. You can also see the difference in tread. The All terrain provides a good balance, whereas the previous tyres would struggle off road because of their linear running tread and narrow gaps that will clog quickly and not "self-clean". There is a lot of discussion surrounding the length of studs required for Wolf wheels. The rims are made of a thicker metal, so there will be less turns on the wheel nut to hold the wheel on. 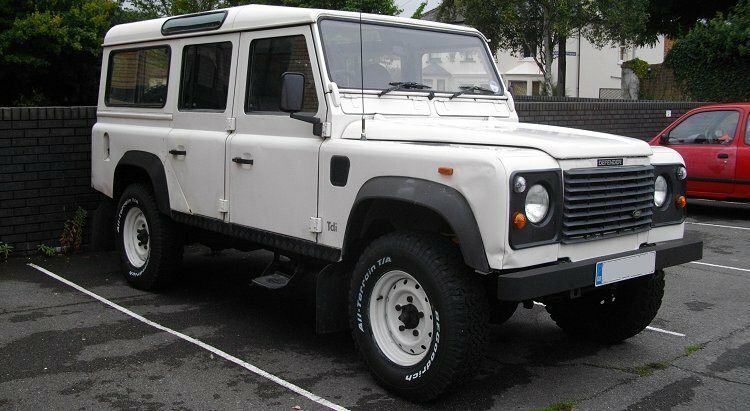 The proper solution is to fit extended wheel studs (FRC7577) as is standard on Defender 130's with Wolf wheels, but at £5 a pop with 5 per hub and 4 hubs, that's a whopping extra £100. Many people report to be running Wolf rims on standard length studs fine. In my personal experience, I can sum up with the pictures below. The first is the standard Land Rover 5.5 inch wide steel rim. The second is the 7inch modular wheel. The third is a Land Rover 6.5 inch Wolf rim. The modular wheel shows that it is thicker than the Wolf wheel and the nut therefore has less turns. I can say i've had no problems running the modulars for the last year like this, and with the Wolf wheels using more turns, i'm quite happy that this is safe enough for me. BFG tyres tend to have a good lifespan so i'm pleased at my rather expensive investment knowing that it will suit my needs sooner rather than later. And lets face it, tyre choice is pretty important for expedition. In Belize running Hankook MTs, I had 7 punctures in 9 months. The following year with Pirelli Scorpion MTs I had none in 8 months. 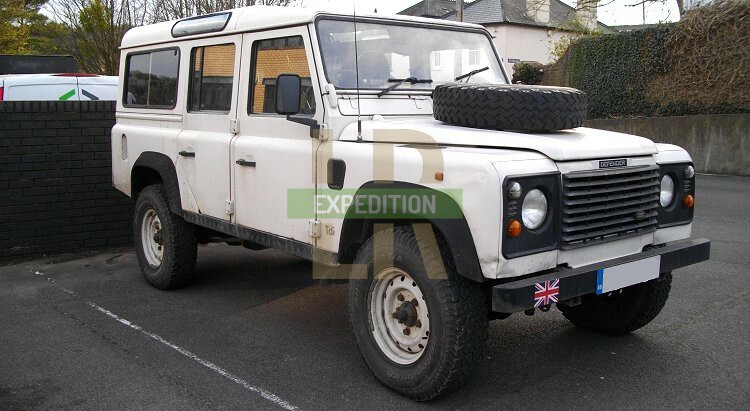 Expedition living is a lot less hassle without having to change wheels and repair tyres! Having had the tyres on the vehicle for 6 years and 27k miles, they have performed extremely well. From an initial tread depth of 14mm they are now around 8-9mm. The trip around Morocco gave them a battering, so there are gouges, scrapes and tiny chunks missing, but no tread blocks have come off. The sidewalls are still in good condition and they've never had a puncture (touch wood). I've also not had a problem with the wheel nuts loosening. I fitted some wheel nut indicators as used on large trucks/buses for some peace of mind. The wheels however are starting to look very scabby. They will need a refurb at some point. The BFG AT tyre has now been replaced with the BFG AT2 tyre, which look a bit different but are supposedly better on road and have better sidewalls. Check out this review from 4xOverland.